I hear from so many frustrated nursing students, and most tell me the same story: they study everything and they feel like they know their stuff, but for some reason they are still struggling to get through their classes and pass exams. They go to their teachers for help, and the teachers tell them, “Practice more NCLEX questions,” or “Get another review book,” or even “Study harder!” The problem is, doing these things are probably not going to help you very much, and some things might actually increase your chances of failing. …the secret is in understanding the content you’re studying. Not just reading it, not just feeling like you know it, or even memorizing it. But really, truly, understanding it. I’ve been helping nursing students do this for over a decade now, so hang with me a sec. I rarely meet a lazy nursing student. There have been a few, but not many. And since you’re taking the time to read this, I seriously doubt that you are one of the lazy ones. What are you doing to understand the information? Do you highlight important points? Does it look like your pages are painted neon yellow? Do you regularly use flashcards? Do you copy or rewrite your lecture notes? Do you write down or screen capture the rationales for NCLEX-style questions you miss? Do you study while watching TV? Listening to music? While texting? Do you feel like you understand the nursing concept when someone explains it to you…but then get questions about that topic wrong on the exam? Do you feel like you still don’t understand how to “think like a nurse”? If you answered yes to any of these questions, then you’re setting yourself up for failure. These are all very superficial methods of studying. No matter how hard you study when using them, you’ll continue struggling throughout nursing school. That’s because it’s easy to “feel like” you understand the material when you put in a lot of study time, but it’s all a waste if you can’t apply the material on tests…or worse yet, on patients! So, How Should I Study in Nursing School? In reality, the only way you will begin to truly understand the nursing material is by independently thinking about it, and seeing how it fits into the “bigger picture” of nursing. Easier said than done, though, right? It’s counter-intuitive to study this way, because it takes more time to study less material…at least, compared to your old way of studying. That’s why most nursing students don’t naturally discover how to study this way, and continue struggling through nursing school. However, when you you study the counter-intuitive way, you dive more deeply into the information you study, which gives you the time and ability to make more connections to other information you already know or are learning. The more often that you do this, the easier it becomes. This is the reason why nursing school actually became EASIER for me the closer I got to graduation, while it got harder for all for all of my classmates who studied the more common way. 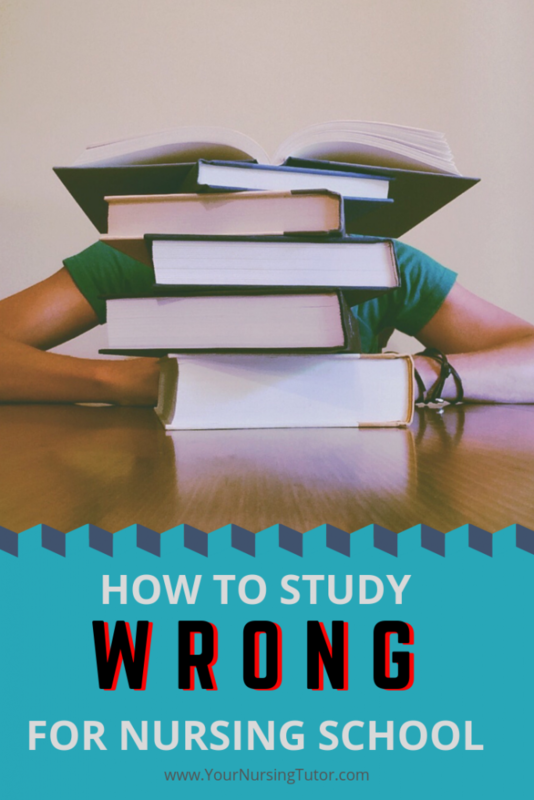 Now that you know that your study habits are causing your struggles in nursing school…what are you going to do about it? You can choose to ignore this and go back to your same old ways of studying. I don’t blame you, doing the same thing over and over again is easier, even if it doesn’t get you the results you want. Or you can choose to try something new, so that you don’t end up in a situation where you’ve failed a class and need to sit out for a semester (or a whole year). Leave a comment below!! What are you going to start doing differently to improve your study skills?